Announcing the winners of the 46th ever Right Place Photo Caption Contest! Presenting the top 30 captions for this picture from AP Photo/Manuel Balce Ceneta via Yahoo! 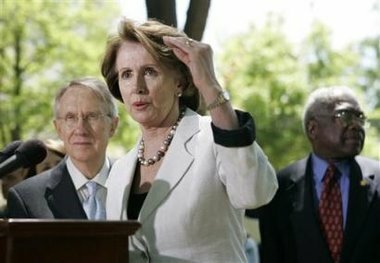 -- Both Harry Reid and James Clyburn attempt to ignore Ted Kennedy lying on the ground, peeking up Nancy Pelosi's dress. -- "Officer, I swear, the squirrel that mugged me was THIS tall. No, I am NOT on any medications." -- "When you pull on the little dangly thing here, the light goes on and off above Harry's head. Watch, I'll show you." -- Nancy Pelosi, on a one-day furlough from "Happy Acres" to attend a Memorial Day picnic, gives a rousing rendition of "I'm a Little Teapot". -- "As a Democrat, I obviously don't have anything relevant to say, so I will now use my allotted time to give you my impersonation of the yellow-throated warbler". -- "You're right, Harry, no shadow. And we can't be seen in mirrors either?" -- "The credibility of the Democrat Party hangs by this thread, right here." -- "Integrity? Sure, the Democrats have integrity. We have this much!" -- PELOSI: "We're looking to the future of Democratic leadership and we see... we see... help me here, Harry." REID: "Sorry, Nancy, I can't see a damn thing." -- "On the count of three, let's all sing 'Don't Fence Me In' ." -- AP BREAKING: Pelosi leaves congress to replace Señor Wences, as Señora Wenches. -- REID: (Thought bubble) "C'mon, Nancy. You haven't heard of 'shrinkage'? For Heaven's sake... they even had a SEINFELD episode on it!" -- PELOSI: "If I could just figure out how to squish heads..."
-- "You mean, you can't see the Pooka?" -- "How many people here think they're gonna be the next speaker of the house... not so fast, Ms. Pelosi!" -- "Zip it! Ziiiiiiiiiip iiiiiiiiittttttt!" -- "Nancy Pelosi removes the last piece of feces from her hair after finally getting her head out of her a**." #10: "I saw Rumsfeld move his hand like this and heard him yell 'cobra strike!' The next thing I knew, I woke up halfway across the room and it was dark out." #9: "The black guy behind me? Oh, that's Patrick Kennedy, he had a costume party at the Betty Ford Clinic." #8: During the press conference, Ms. Pelosi tried repeatedly to brush back her unsightly donkey ears, with little success. #7: "This is how high the money is in MY freezer." #6: At a DNC fundraiser, Nancy Pelosi auctions off an evening of boxing in Vegas with the Senate Minority Leader. #5: "All those Botox shots, piled up on top of each other, would reach THIS high." #4: "Under our heightened border alert immigration plan, anyone in this country illegally, who is at least this tall, will go to the head of the line for citizenship." #3: PELOSI: "I've had it up to here with the Culture of Corruption." REID: (Thinking) "I wonder if I can get more boxing tickets?" #2: "You must be at least this tall, and a liberal, to try and destroy the United States of America." #1: "I've had it up to HERE with my own bullsh*t!"